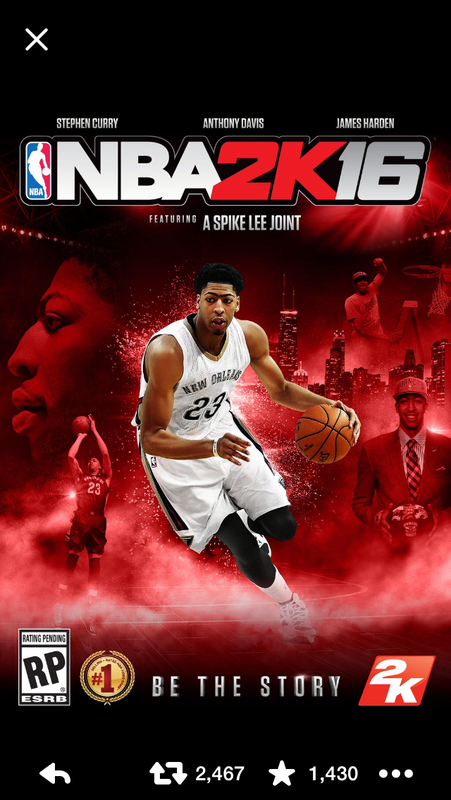 There are three covers for the new NBA2K 16 installment. 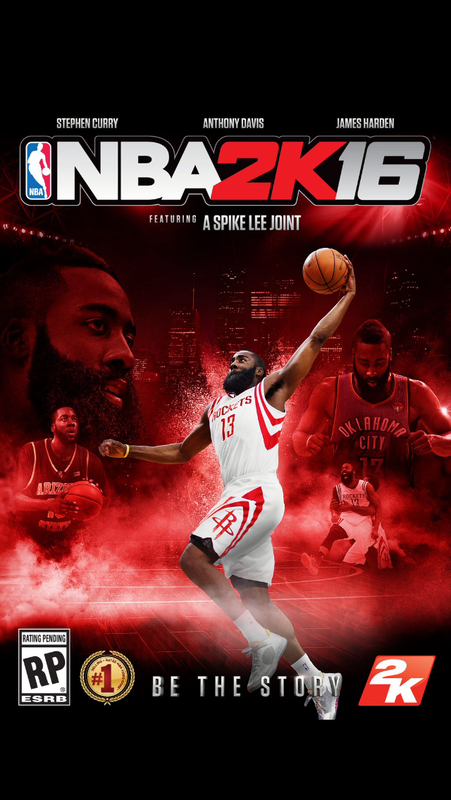 One of the covers features Houston Rockets guard James Harden. The third cover features the next great NBA superstar Anthony Davis. 15 days of regular season remain and Golden State has inched closer to earning home court advantage throughout the entire NBA playoffs. In losing to the Warriors, the Clippers lost ground in their pursuit of home court advantage in the first round of the playoffs. Golden State rallied from 17 points down to beat the Clippers in Los Angeles, 110-106. They extended their winning streak to ten games, while snapping the Clippers streak at seven. Steph Curry and Klay Thompson combined to make 14-of-25 shots in the final three quarters for 47 points after making just 2-of-11 shot in the opening quarter. The Warriors are now 5.5 games up (with eight to play) on the Hawks for home court throughout. Warriors Draymond Green missed the game to rest his shins. Clippers Jamal Crawford missed his 14th straight game with a calf injury, although is tentatively scheduled to return within the week. San Antonio won on the road at Miami, 95-81, leading nearly wire-to-wire. Kawhi Leonard scored 22 points in 38 minutes, Tony Parker was the only other Spur to play more than 26 minutes, he played 26:05. They finished March 12-3 for the league’s second best record, behind only Golden State, who went 16-2. Six of the top eight teams are in action tonight. The Rockets host the Kings, who are without Rudy Gay who suffered a concussion on Monday night. They could also be without DeMarcus Cousins, who say out Monday’s loss to Memphis with various minor injuries. Reports also suggest the Kings are contemplating shutting Cousins down for the remainder of the season. Houston is 2-0 against the Kings, though one of the wins came in overtime in Sacramento. Since Houston plays at Dallas again on Wednesday, Dwight Howard will only play in one of the two games and it has not been determined which one that will be. 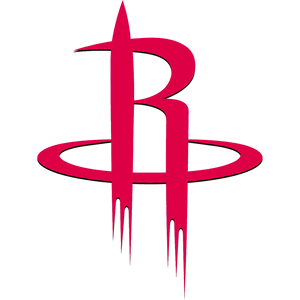 Houston is banged up as usual, with Donatas Motiejunas (back) and Kostas Papnikolaou (ankle) out and Terrence Jones (pneumothorax) still questionable. Pat Beverley had surgery on his left wrist on Tuesday and is out for the season. The Clippers try to start a new win streak as they play at the Blazers. Los Angeles has won two of the three games against Portland, including the one previous meeting in Portland. That night they got 25 points from Crawford, who is not expected to play (calf). Also Portland was without Robin Lopez in that game, but had Wes Matthews back then in January, but he’s now out for the season (achilles). The Spurs are at the Magic where they can clinch a playoff berth with a victory. San Antonio has beaten Orlando seven straight times. They have also won four straight overall, topping those opponents by an average of 21.2 points per game. On the second night of a back-to-back, it’s likely some Spurs will get a rest. If Oklahoma City has any hopes of avoiding Golden State in the first round, then they need a win tonight at home against the seventh seeded Mavericks. Monta Ellis (calf) missed the Mavericks last game, a 104-99 loss to the Pacers, but he went through practice on Tuesday and is listed questionable for this one. Oklahoma City can even the season series with a win and have won six straight at home and 20 of their last 22 in their home arena. Westbrook is averaging 31 points (1st in NBA) and 10.2 assists (2nd in NBA) per game since the beginning of February. Obviously, the Thunder continue forward without Kevin Durant, who had bone graft surgery on his right foot Tuesday and will be held out of basketball activities for four to six months. Nick Collison ankle), Andre Roberson (ankle) and Serge Ibaka (knee surgery) are also out. Here’s the look at the standings and the remaining schedule. Click the graphic to enlarge. Check back daily for the latest updates. League says there were three calls missed over final two minutes of regulation and overtime of Rockets 105-103 victory on Sun. Mar. 1. Indianapolis was the only team with a negative turnover margin (-5) to make the playoffs. Also, they were (+5) against Tennessee and Jacksonville and (-6) against playoff teams. They had positive turnover margin in only five games. Cincinnati’s Andy Dalton, now in his fourth season, will be making his 4th career playoff start. In his first three playoff games, he has thrown a total of two touchdown passes, one to his own team and one to his opponents. 20 active QBs have thrown at least 50 postseason passes, they have all been on the winning side at least once, except for Andy Dalton. Peyton Manning entered the league in 1997. Among the 30 QB’s (active or retired) with at least 120 postseason passes since then, including Manning, Andy Dalton is the lowest rated passer at 56.2. He’s also the only QB with less than four touchdown passes. He has one. Tom Brady has been the Patriots starting quarterback for their last 26 playoff games. He and the team won each of the first ten games he started, including three Super Bowl wins. In their last ten playoff games, they have just four wins. He has 16 touchdown pass an eight interceptions in those 10 games, but he had six of those touchdowns in one game. THey’ve scored 17 points or less in five of those ten games and lost all five. They’re 18-8 in the 26 games overall and no quarterback has been at the helm for more playoff wins than Brady. Since 2008, when Joe Flacco entered the league, he has 19 TD passes in the playoffs – which leads the NFL. His Ravens also have 9 wins in his 13 starts. That’s the most victories, too. Although Russell Wilson, Eli Manning and Ben Roethlisberger have a higher winning percentage over that time. But in that same time, among the 19 quarterbacks with at least 70 attempts, Flacco is the 13th rated passer and the only quarterback with a lower completion percentage is are Andrew Luck. Roughly one-third (33.8 percent) of Flacco’s career postseason passes were thrown during his ridiculous, four-game championship run in 2012, when he threw 11 touchdowns and zero interceptions. He had a passer rating of better than 106 in each of those four games, yet his career postseason passer rating in 13 games is just 86.2. That’s because in his four postseason trips before that magical run, his passer rating was a pathetic 70.4 and he had the same number of touchdown passes as interceptions, eight. Miraculously, the Ravens still managed to win five of those nine games. Houston Texans defensive end J.J. Watt received only 45 of a possible 50 votes for All-Pro at his listed position of defensive end. But five voters voted him at defensive tackle, which means all 50 voters felt J.J. Watt’s historic season was worthy of first-team All-Pro selection. Technically, he’s a first team performer at defensive end and since only three players received more votes at defensive tackle – he’s also a second team All-Pro at that position as well. No other Houston player received any votes. Repeaters from 2013 were Watt, Thomas, Suh, Kuechly, Sherman and Thomas. Click here for the total voting breakdown. Never satisfied, the Houston Rockets are on the verge of adding their third player in less than a week to a rotation that already had the team near the top of the western conference standings all season. Multiple reports early Wednesday afternoon suggested the team has agreed to a deal with free agent forward Josh Smith. This acquisition comes just days after Rockets general manager Daryl Morey swing a deal to add wing Corey Brewer and guard Alexey Shved. Smith was surprisingly waived on Monday by the Detroit Pistons, who had signed him to a four-year, $54 million contract prior to the 2013-14 season. With such a large salary commitment still due Smith, it was not surprising that Smith went unclaimed by Wednesday’s 4:00 p.m. central deadline. The Rockets had engaged in discussions last offseason in an attempt to acquire the 29-year old forward, but were unable to reach any deal. Even with the emergence of Donatas Motiejunas as a capable scoring threat in the paint, the uncertainty regarding Terrence Jones’ return from his nerve injury in his left leg, leaves the Rockets eager to add another front court player that can help on both ends of the court. Smith spent nine years in Atlanta, before moving on to Detroit, and has often been described as mercurial, with a penchant for me-first basketball. His shot selection has been a source on constant criticism and rightfully so. He is a career 27.8 percent 3-point shooter, which is compounded by the fact he shoots so many of them. Since the start of the 2012-13 season, 88 players have attempted at least 500 3-pointers. Only two of them are successful on less than 30 percent of those shots. One is Josh Smith. The other? His soon-to-be new teammate Corey Brewer. The key to making both of those two, new, established veteran acquisitions thrive with the Rockets is putting them in a better position to take, and hopefully, make shots better suited to their skills. In one outing, Brewer already displayed how he will help this team offensively. His 2-of-4 3-point shooting was merely a bonus. He plays the passing lanes brilliantly and for a team that wats to run, he adds a capable facilitator on the fast break. Following a deflection from Brewer, he pushed the ball up court and found James Harden streaking to the basket for a slam dunk. Later in the game, he again created a turnover and pushed the ball up court. He found Jason Terry well behind the 3-point line and even with a less than perfect pass, Brewer picked up another of his four assists on the night, when Terry swished home the 2000th 3-pointer of his career. Smith can help the Rockets offensively by staying close to the basket. By grabbing rebounds, and likely by running pick and roll with Harden in similar fashion to how Dwight Howard runs it with the all-NBA shooting guard. Harden is adept at quickly launching alley-oop passes to Howard, but has been frustrated in similar pick and roll plays with teammates playing below the rim. Smith only has 10 dunks this season, and averaged 0.8 dunks per game in his 105 games with Detroit, after posting nearly 1.4 dunks per game in his 676 games with Atlanta.. But some of that is a factor of playing more small forward with the Pistons than he likely will play with Houston. The bottom line is with his long track record of being a subpar long range shooter, he must be committed to taking better shots. Consider now, how Smith could help defensively. Remember that list of 88 players? Well, Smith has more blocked shots than any player on that list. By a lot. Kevin Durant has the second-most blocked shots with 172. Smith has 293. He’s also 21st on that list of nearly all small forwards and guards in steals. Three of the 20 players in front of him, will now be his teammates, Brewer, Harden and Trevor Ariza. Smith has been a good help defender off the ball at the rim his entire career, which is something the team desperately needs when Howard is off the floor. He’s a good rebounder and should be an asset in transition, too. Signing a player of Smith’s caliber to just under two million dollars for the remainder of the season is well worth the risk for a player that if he were a model teammate and team player, would clearly not be available otherwise. The Rockets were 0.9 seconds away from trying to close out their first round playoff series in May with the Blazers at home in a game seven. With a team they thought could challenge for an NBA title coming off a 54-win season. Roughly seven months later, the Rockets have pursued and failed to acquire Carmelo Anthony, Kyle Lowry and Chris Bosh. They allowed Chandler Parsons to become a restricted free agent and ultimately decided not to match his lucrative three-year contract offer from the Dallas Mavericks. But they were also aware from their series loss against Portland that there were issues with the style and focus. They were not a bad defensive team over the course of the 2013-14 regular season, but they were a bad defensive team in the playoffs. After not making any of those enormous impact acquisitions, the Rockets instead have added two players who impact the game tremendously with their defense and have won an NBA championship in Ariza and Brewer. They added a veteran in Jason Terry, who has also won a title and has continued to be an excellent 3-point shooter. Now they’ve added Josh Smith, who if nothing else, can help fill the void left by Terrence Jones, who has been out since the fourth game of the season with a nerve issue in his left leg. Jones has remained out indefinitely for the last several weeks as the team is unsure when he might regain the needed strength in his leg. Houston’s next game is Friday night in Memphis for the third meeting if the season between the two teams. Each team has a lopsided victory in the two meetings. Smith could be in uniform for that game and likely in the starting lineup if available. Week 15 edition: Will the Texans make the playoffs? If the Texans win their final three games, which would include a first-ever win at Indianapolis, then the Texans almost assuredly will make the playoffs. At 7-6, they are currently 8th in the AFC and trail three teams, Baltimore, San Diego and Pittsburgh by just one game. If the Texans are 10-6 and with the Steelers as a division champ, the only way the Texans would NOT be in the playoffs as a wild card team is if the Chargers win out (vs Den, at SF, at KC) AND the Bengals win their next two games, before losing to the Steelers in week 17. (Though if the above happens AND Denver loses out (at SD, at Cin, vs Oak), the Texans would be the final wild card team and the Broncos would miss the playoffs!). 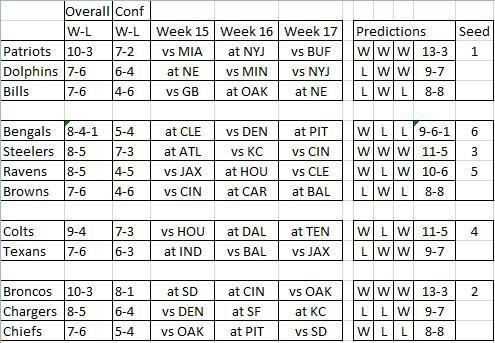 Here’s a look at the AFC situation in a nutshell, plus my projections for the remaining games. Note I do not have the Texans winning at the Colts and I do not have them making the playoffs at 9-7. 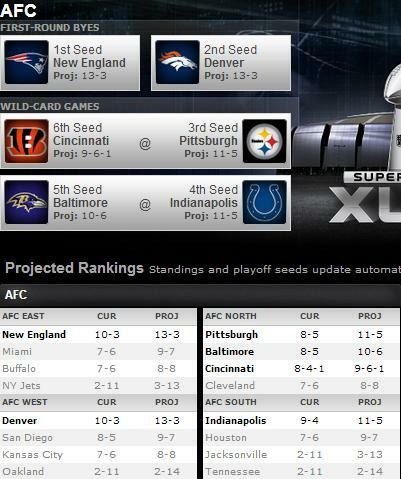 I also include the final standings and playoff set-up should my projected results play out (h/t ESPN Playoff Machine). Here’s a link to the playoff machine. Just a slight tweak to the above, like a Ravens loss in week 17 to Johnny Football, would put the Texans (9-7) in the playoffs, even if all my other projected results stay the same. Texans down 17-14 at the half, but are (+2) in turnovers. The Eagles are having little trouble moving the ball, with 268 yards of offense in the first half. Most of that came through the air with 202 yards passing from the combo of Nick Foles and Mark Sanchez: 17-22, 202 yards two touchdown, two interceptions. – When both Texans starting corners went down early in the game, it figured to spell trouble for the Texans. Well, Eagles head coach Chip Kelly is smart, they attacked Andre Hal consistently the rest of the half. Hal gave up a long 59 touchdown to Jeremy Maclin almost immediately after he came in for Kareem Jackson (knee). He was beaten on the second touchdown toss, too, when backup Eagles quarterback Mark Sanchez threw one right past him to Jordan Matthews in the back of the end zone. Johnathan Joseph left the game to be evaluated for a concussion, he Went to the locker room, then returned to the sidelines, then returned to the locker room again, all before halftime. Rookie Jumal Rolle found the field quite a bit and off a tipped pass intended for the Eagles Josh Huff, Rolle got his first career interception. Overall: The Texans have struggled to run the ball and they a costly false start early in the game from Duane Brown that forced them to punt. The Foles injury has not really done anything negative to the Eagles offense. Sanchez has looked darn good for a guy that hadn’t thrown an NFL pass since 2012. The Texans have to get competent play from Bouye, Rolle and Hal the rest of the game, because it doesn’t appear that either Jackson or Joseph will return.